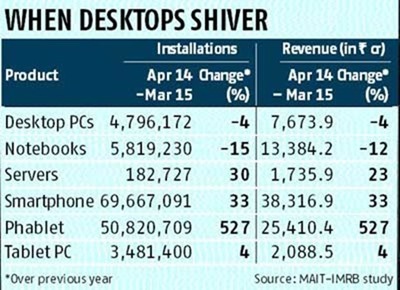 Has the death knell finally started ringing for the PC market in India? Ever since the first computer was introduced in India in 1965, PC sales have decreased for the first time in India. During 2014-15, only 10.6 million PCs (desktop + laptop) sold in the country, which is a decrease of 10% compared to last year. The most striking thing is that laptops, which were the harbinger of growth since last few years, declined by whooping 15.8%, as only 5.8 million units were sold last year. Desktop sales were down 4% to 4.7 million units. In terms of revenues, PC market declined to Rs 21,058 crore in 2014-15 from Rs 25,117 crore in the previous fiscal. However, if we consider total hardware market, which includes Computers, Servers and Printers, then the total sales recorded, was 11.8 million units, amounting to Rs 95,220 crore, which is a healthy increase of 23.98% compared to last year. Households, which were one of the strongest drivers of growth of laptop sales, registered a dismal 26% negative growth, creating a ripple effect across the sector. It is not a secret that mobiles and phablets are the leading cause of this massive decline, as the computing preferences are changing faster than we thought before. The report observes that a first time buyer of any computing device prefers for a laptop or desktop; but those who already own one are ditching it’s usage and opting for a more flexible and feature rich alternatives in the form tablets, phablets and smarthphones. 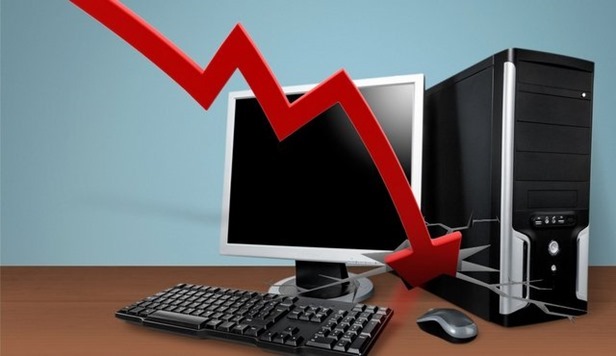 The forecast for 2015-16 is not good for desktop, as the report predicts further decline of 10%; however laptop sales may increase and post a positive growth rate of 17%. One reason which is being speculated for dismal performance of notebook sales is that, in 2013-14, UP Govt. had procured 15 lakh laptops which create a major difference while comparing 2014-15 as there was no major Govt. order. Desktop sales posted negative growth last year as well, but the positive growth from laptop sales had balanced it. But this year, both have shown negative growth. Phablets, which are mobile devices having screen size more than 5 inches, recorded a gravity defying increase of 527%, compared to last year. Total of 50.8 million phablets were sold last year, and for the next year, it is expected to increase by 65%. Smartphone market also continued with the surge, as it recorded 33% increase to clock 69.67 million units. Another interesting point: tablet growth has now slowed down to 4%, after clocking double digit growth since last couple of years. 3.48 million tablets were sold last year, which is predicted to fall down as more people are opting for phablets now. The report has specifically mentioned that the only way to increase PC sales in India is by active assistance from the Govt. and wider implementation of Digital India movement. When every household in the country will have a PC, then the market will automatically increase. PC sales may witness an increase of 17% next year, as Tamil Nadu Govt. is planning to purchase 1.1 million laptops. Lenovo has put the lowest bid as of now, for this tender.